Late last year Cassels & Sons came up with an initiative to raise funds for the charitable organisation Clown Doctors New Zealand, by donating a portion of all Christmas function bookings made from September 1st until Christmas. Clown Doctors New Zealand work in hospitals in Christchurch, Wellington and Auckland, striving to create a positive atmosphere at a time and place when hospital patients and their families most need an emotional boost. They also run various other initiatives, including offering workshops in workplaces, as well as skits and speakers for corporate events. 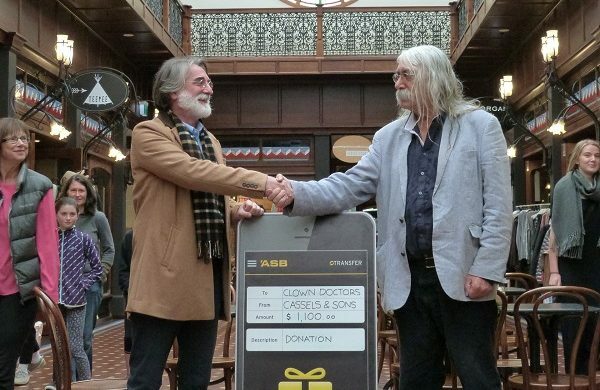 Alasdair Cassels presented the donation to Thomas Petschner, CEO of Clown Doctors New Zealand, in the Atrium at The Tannery. Donations such as this help them continue to bring joy and laughter to children in hospital. For more information on Clown Doctors New Zealand and the work they do, visit their website.